Samsung Galaxy S3 to get Note II's multi-window feature? Multi-window soon for Galaxy Note II? 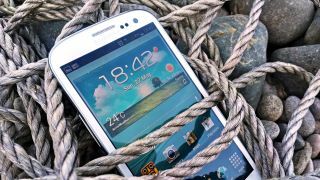 Having just launched an Android Jelly Bean update, Samsung is reportedly preparing another software boost for the Galaxy S3 handset. According to SamMobile, the company plans to extend the reach of the multi-window functionality recently included in the Galaxy Note II. Multi-window is really a neat feature as it allows for true mobile multi-tasking; not just the ability to switch seamlessly between apps, but to use two apps at the same time. For example, users can browse the internet using Chrome and send an email using Gmail while both apps are displayed in a split screen. The multi-view feature would be a welcome addition for Galaxy S3 owners, given the abundance of screen real estate offered by the 4.8-inch Super AMOLED HD device. SamMobile claims that the update will arrive by the end of the year and also bring with it some minor stability improvements. Will Google's special event on Oct. 29 see the announcement of some new Jelly Bean features that could also hitch a ride with this rumoured S3 update? Check in with TechRadar Monday to find out.